Seth Carey's law office in Auburn. One surprise in Tuesday’s election that may have gone under the radar is the unofficial victory of Seth Carey in the Republican race for the district attorney nomination in Androscoggin, Franklin and Oxford Counties. Carey’s apparent win is unusual for several reasons, including the fact that his law license is currently suspended. Carey’s law license has been suspended because he allegedly sexually abused a woman in his home in Rumford. A former client who moved in with him, the woman was granted a protection from abuse order against Carey. He’s appealing both actions and says he will spend the next five months trying to clear his name. Maine law requires candidates for DA to be lawfully admitted to the bar. Carey faced an uphill battle in the race not just because of his history of legal problems — he’s been suspended before — but also because of his rival. Alex Willette is a former Republican legislative leader and Army officer who currently serves as an assistant district attorney in Sagadahoc County. Willette was considered the favorite because of his resume and because of the GOP’s position in the race. After the allegations against Carey were made public, the Republican party chair asked Carey to bow out because of what she called “actual, credible accusations.” He refused. Carey raised less than $200, and made and posted handmade signs around Lewiston and Auburn. Even he is not quite sure how he managed to navigate the path to victory. He says voters are smarter than they seem and likely identified with his message of fighting government corruption, overspending and the political establishment. Alex Willette could not be reached for comment, but in a Facebook post to supporters he acknowledged that he came out short in the race and was disappointed. “While not ideal, I am looking forward to relaxing this summer and helping my friends running for office across the state,” he said. 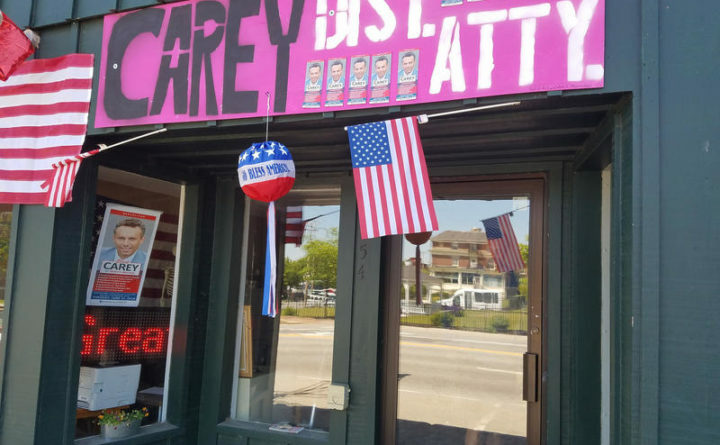 If Carey is confirmed as the Republican nominee he will face incumbent District Attorney Andrew Robinson, who ran unopposed in the Democratic primary.